Stop number two on the WCCC circuit was exceptional thanks to the UNR Wolf Pack and welcoming Sky Tavern staff, who brought the event to the scenic and friendly Sky Tavern Ski Resort just outside Reno, Nevada. The sea-level acclimated HSU Cycling Team would rise to the challenge of the thin air and moon dust at over 8,000 feet in the Nevada mountains. The weekend opened with the Sky Tavern Sufferfest XC. Starting at the lodge, the race course immediately climbed over 1,000 feet vertical up a resort service road each lap. 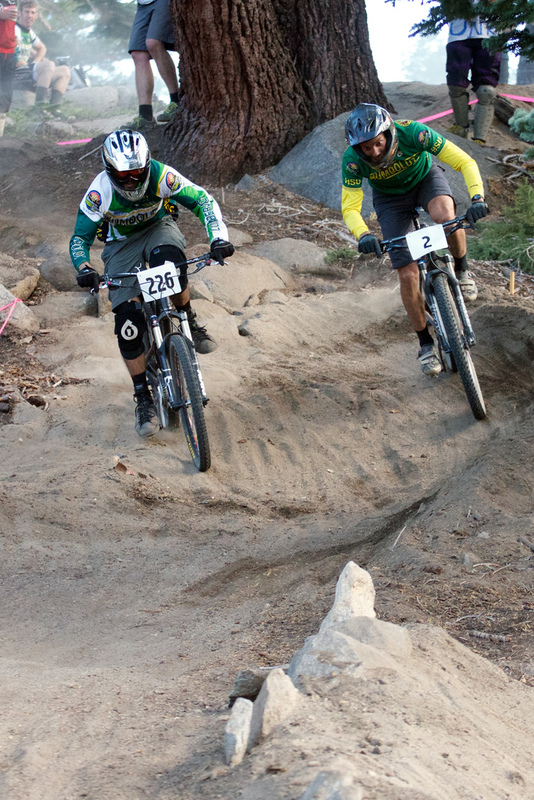 Once near the summit, riders were greeted with challenging single track combined with rough, rocky and loose descents that proved a major hurdle. Marina Marcroft claimed a fantastic 2nd place in the women’s C race, representing her HSU Cycling sisters who could not make the trip. Despite the challenging course, Marcroft was disappointed that her class only did one lap. She would have welcomed a second go after getting to see the whole track. In the men’s C XC race, Joseph Wright finished 14th in a large field in his first race at altitude. The men’s A riders raced three laps on the challenging track, where Steven Pearl and Justin Graves represented HSU Cycling. 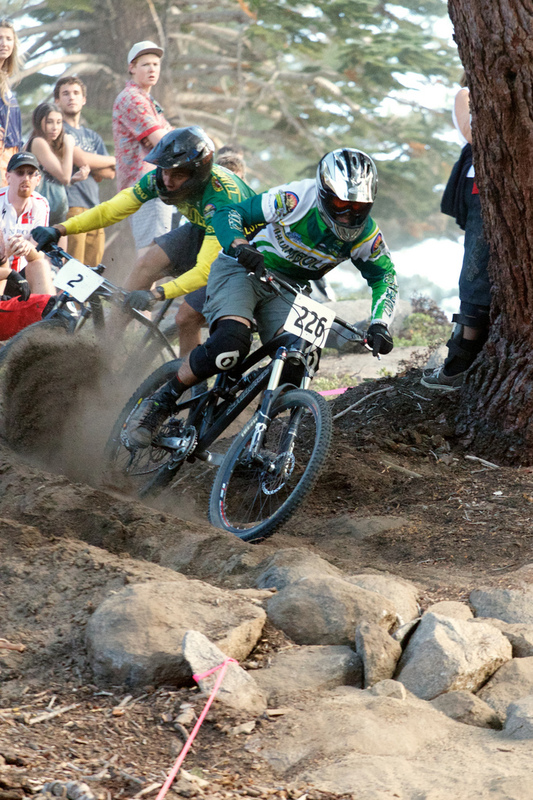 From the start, Pearl pushed the pace and was soon the only rider to stay in contact with the eventual winner from UNR. 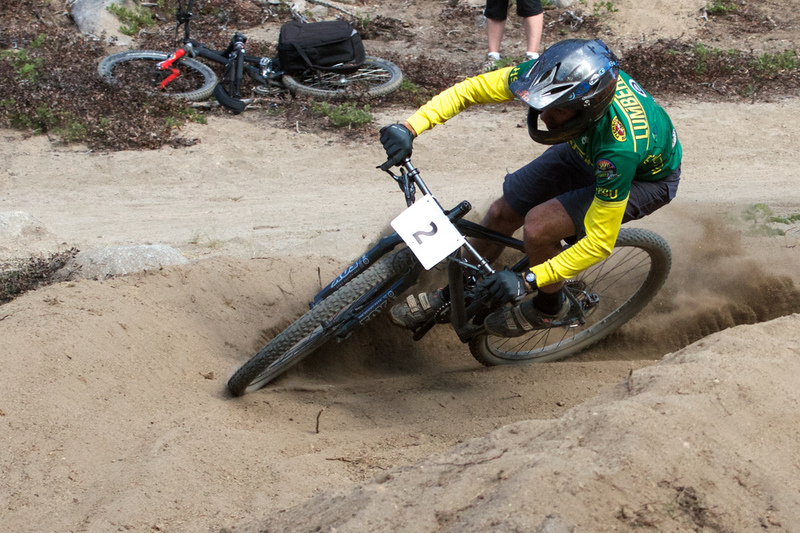 “It was just one of those days,” Pearl said, who took an impressive 2nd place against a stacked field of rock-adept riders from UNR, Cal Poly and beyond. Graves struggled in the altitude, riding consistently but lacking the pace to challenge the lead riders. Graves slipped to an eventual 11th, but said the highlight was blowing by that USC rider who was dismounting for a hairy part of the descent. 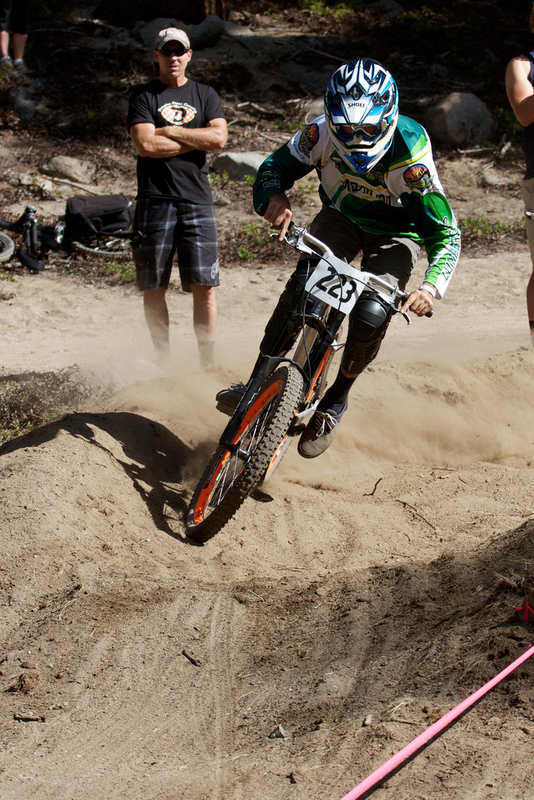 Saturday afternoon was the dual slalom event on a short, fun and fair track. The course started with two separate lanes, each with a treacherously loose left hander that sent many riders to the soil. The lanes merged halfway down in a small rock garden making for intense racing and spectating. The rider who made the merge first was all but guaranteed victory. Mistakes were common, making qualifying a tenuous situation. HSU’s Justin Gore narrowly missed the men’s C finals, with a wipe-out in the notorious blown out left hander on the right course. Clayton Kelley made the show, riding a smooth first round but was eliminated to finish 11th. The men’s B field was all about HSU: Derek Roelle qualified as did Steve Pearl who turned heads qualifying 3rd on his XC 29’er. Louis Pitschke stormed into 1st place qualifier. Roelle advanced on his DH bike, exhibiting smooth moto skills in the courses rhythm section to finish 5th. Crowd-favorites Pearl and Pitschke would consistently take apart their competition, with everyone rooting for the “guy killing it on the 29’er!” Before we knew what happened, it was an all-Humboldt final with Pearl and Pitschke in the gate. The B’s final would be some of the tightest racing of the day as Pearl and his 29’er took Pitschke to the limit, almost upsetting the top qualifier in the second round before making a small bobble at the merge. The atmosphere was electric. At the end, Pitschke got 1st, Pearl 2nd, and fathers were coaching their sons on how these two were riding. 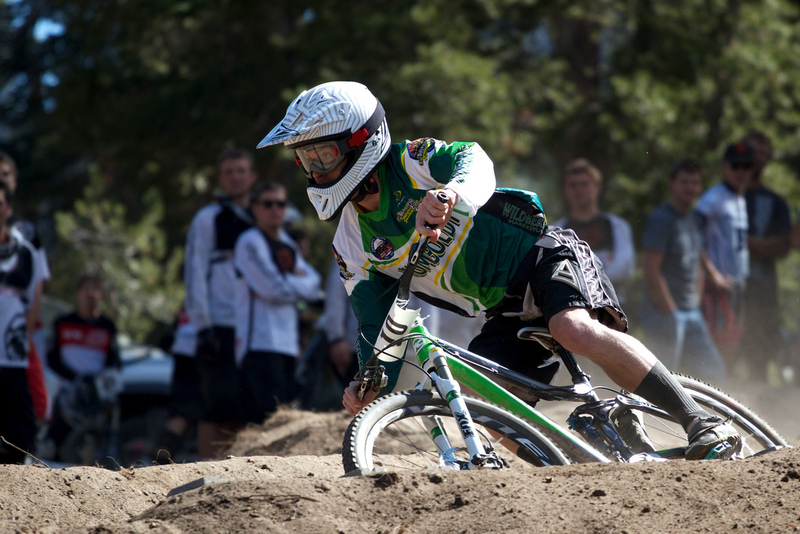 In the men’s A dual slalom, Dylan Wright narrowly missed qualifying in finals by a mere .3 seconds. Justin Graves surprised himself by laying down the 2nd fastest qualifying time in his first slalom of the season, besting the eventual race winner’s time. But it was not Graves’ day. Leading in the first heat Graves self-destructed in the traitorous left hander on the right lane. “I knew it had become the trickier lane, so thought I should feel it out in the easy first round. Bad decision,” said Graves of his early exit from the finals, which put him in 9th place overall thanks to the solid qualifier. Pitchke v. Pearl in B Slalom Final at the Merge! Sunday morning was the short track featuring a paved climb followed by a loose 180-degree turn into a series of fast berms back down the mountain meadow. Marcroft moved up and scored a solid 6th in the women’s B field. Joseph Wright improved on his result from the day before riding to 8th place in the men’s C race. Pearl was the only other HSU rider competing in this event, but boy did he represent. Pearl blazed up the first climb to take the critical hole-shot into the first loose left, and from here it seemed he might run away with it. After extending his lead for several laps riders from Cal Poly, UC Davis and Stanford bridged up on the climb and begin to put pressure on the Pearl. “I was glad when somebody passed me, it gets pretty stressful being out front the whole time,” said Pearl of the few laps he got to sit in. However, none could hold Pearl’s pace through the berm section, as he passed the brief UC Davis leader in the tight descent to regain the lead. Soon it became a two-man race as road convert Paul Summers of Stanford put in a hard drive on the pavement climb to open up a gap on Pearl. However, Pearl was patient and slowly applied pressure to Summers until he cracked, slipping out in the tight left at the top of the course, allowing Pearl to pass and regain a lead that would not be undone. Steve Pearl with the commanding win! 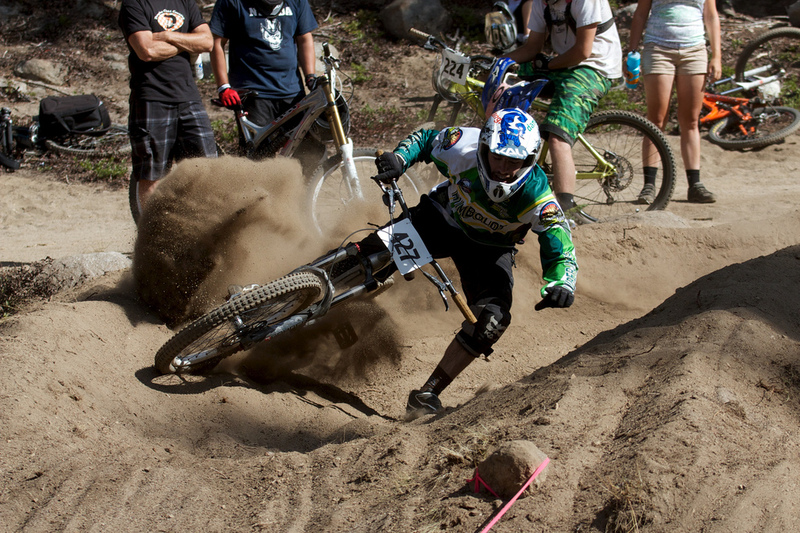 The weekend concluded with the downhill on a course that proved a grand challenge even for the top riders. Large rocks gardens, drops and jumps combined with incredibly deep moon dust made getting down the course without incident a victory in itself. Most riders agreed it would be a race of attrition, and it was so as practice and the finals saw most riders crash, some discovering themselves thrown well off track. HSU Cycling’s Gravity Squad was well represented. On the men’s C track, Justin Gore was having a great run until he got caught up on the final loose log drop of the course. “My bars twisted and my thigh was stuck between my bar and my top tube, so I couldn’t spin it back quickly,” said Gore of his bobble. Despite that, Gore finished inside the top ten in 7th. Clayton Kelley had a great run as well, aside from blowing his feet off before the big step-down forcing him to skip the jump and lose some time putting him into 5th spot. Derek Roelle was looking good all weekend but fell victim to the first steep rocky chute on course, going OTB and losing a shoe! Somehow he managed to re-shoe himself and rip down the rest of the track to still take 6th! “I’d been having trouble with the chute and as I was coming in I just knew it was going wrong,” said Roelle of the course’s dangerous early drop in. Astounding, yet again, was Louis Pitschke. Pitschke suffered three major crashes in his race run and still caught the rider who started a minute ahead. Pitschke blazed through the finish breathing hard with dirt in his teeth to take 2nd place in Bs with a time that would beat many of the A riders! “I was pedaling too much,” said Pitschke of the pedal strike that had thrown him to the ground. The last two riders down the hill in men’s As, due to late registration, were Dylan Wright and Graves. Wright crashed at the top of his run and struggled in the bottom to finish deep in the field. “I just couldn’t keep my feet on the pedals,” Wright said. All said it was a wild weekend of competition, with HSU Cycling setting the pace in many races. Check out the helmet cam of Graves’ 2nd practice run of the day to get a taste of the moon dust action. This entry was posted in HSU Cycling Club, Mountain Bike Season 2012 and tagged Sky Tavern Sufferfest. Bookmark the permalink. I agree that blowing by that same USC rider was a highlight. The first three men’s Bs (I was third) passed him at the bottom of our second lap in the same spot. Always fun to pass the 12th place A starting 2 minutes behind.